The breeding colonies of gentoo penguins are located on ice-free surface. Colonies can be directly on the shoreline or can be located considerably inland. They prefer shallow coastal areas. 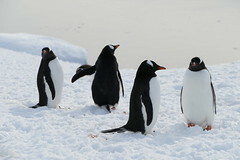 Gentoos live mainly on crustaceans, such as krill, with fish making up only about 15% of the diet.